Need an unsecured, personal loan in Nigeria? Start here. January is notorious for being a financially difficult month (except for those in the business of education). The christmas festivities, the loooong wait until the end of the month for salary payments and for parents, the demand for school fees at the beginning of the month make January a difficult one financially for a lot of people. Luckily, for salaried and self-employed workers, there are financial organisations whose job it is to lend a helping hand in these difficult times with no request for collateral, and I have compiled a list of some these. While most of these organisations cater for Lagos-based workers, there are some who will accept workers from other parts of the country. Budget. Base your borrowing on what you can comfortably afford to repay each month. Borrow as little as possible. Borrow for as short a term as possible. While it can be tempting for longer terms on loan repayments, it is important to note that ultimately, these cost more in the long term. Borrow N200,000 over a 3 month period and you ll have to repay ‎₦239,147 (‎₦79,715 monthly). 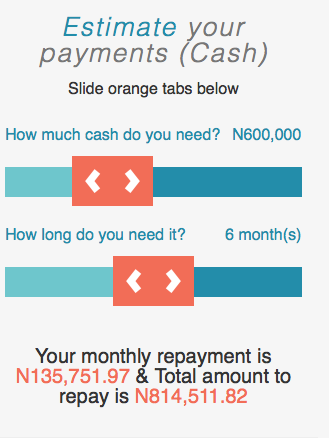 The same amount over a 12 month period will cost ‎₦343,650 (‎₦28,637 monthly) 170% of the original loan amount, and a difference of ‎₦104,503! It is always good idea to check with lenders that they allow early repayments, and also to confirm their terms for doing so. Some lenders might charge you more to repay the balance on your loan early, especially if you are close to the end of the loan term, therefore it is important to check from the onset. Renmoney is a consumer finance organisation which operates from 89 Awolowo road, Ikoyi, Lagos. They offer cash loans to Lagos-based salaried workers in (proof required) for variable payment terms as little as 3 months.They operate a very simple website which allows you calculate your repayments against your desired loan amount and payment terms. They promise to pay within 24 hours of verifying documents, as long as the applicant is in a regular job and can provide proof of income. Be between ages 22 – 55 years. Live and/or work in any part of Lagos. Have a secure job paying at least ₦50,000 monthly, into a bank account. Must have a verifiable place/terms of employment. Have a functional current account with a BVN number. You will be asked for a 6 month history of bank statements. Have valid means of identification – International Passport, Driver’s License, National ID Card. You will find a full list of requirements here. Head Office: 89, Awolowo Road, Ikoyi, Lagos, Nigeria. Surlier: Adeniran Ogunsanya Street, Surulere. Opebi: Pentagon Plaza, 23 Opebi road, Ikeja. Lagos Island 50 52, Broad Street, Lagos in CSS Bookshop HouseApapa: No. 13, Park Lane, Apapa. Direct Bridge is a consumer finance company operating in Nigeria and focusing on short-term consumer loans between ₦50,000 and ₦500,000 (depending on income) to low to middle class income earners. Loan terms are variable, between 3 and 9 months. Must be in employment (paid or self-employed). Must maintain a bank account not less than six months old. A signed direct debit mandate. You will need to fill out an application form, (downloadable here) and take to their office with the supporting documents from the list above. If approved, they promise to credit your account within 24 hours. Salary Advance NG is a product of the Addosser Microfinance bank, which provides funding solutions designed to bridge the funding gap for Lagos-based, full-time employees for personal needs. They are able to provide between ‎₦100,000 and ‎₦2,000,000 to customers for up to 12 months. Their easy-to-navigate website helps customers calculate loan repayment options against varying periods and amounts, to access affordability before even speaking to anyone on the phone. This provider requires a guarantor, who is required to be a work colleague with an income bracket above that of the applicant. You will need to print and fill out this form, attach the supporting documents take to the one of their offices.